You are here: Home / Travel / Is Snorkeling In Akumal On Sunday A Good Idea? Is Snorkeling In Akumal On Sunday A Good Idea? Many times travelers visiting Playa del Carmen have doubts if snorkeling in Akumal on weekends or Sundays is a good idea as there may be a crowd. One such tourist is planning to a day trip to Akumal from PDC. The wish list includes snorkeling in Akumal beach, Half Moon Bay and Yal-ku Lagoon, Cenote diving and eating at popular restaurants. All these places are busiest around holidays and weekends as can be expected but still the crowds are relatively less as compared to the beaches in Cancun and Playa del Carmen. Among these places, one will find less people in the Half Moon Bay. If you’re coming without any tour operator then try to reach during early mornings before tour operators start crowding the waters. Parking space also gets filled up quiet fast so getting early is a good idea. 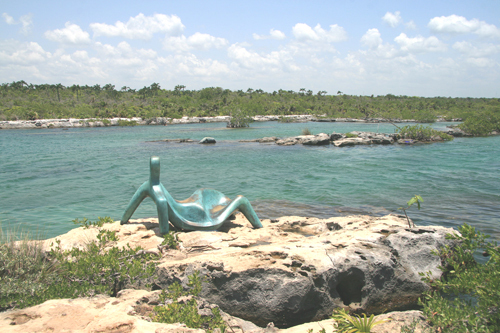 Including a cenote excursion can make the schedule very tight as will take away the essence of relaxing in Akumal Bay. Cenote diving can be done on a different day. One fellow traveler gave an alternative suggestion. One can start from the Akumal Arch and hire a golf cart/buggy to Yal Ku Lagoon for snorkeling. After that, lunch at La Buena Vida restaurant which is quite famous in Akumal. You can give snorkeling at Half Moon Bay a miss and instead head over straight to Akumal. For snorkeling, swim towards the reef. One can spot many sea turtles in and around the grassy areas. Later you can have a dinner at La Cueva. Snorkeling gear can also be rented easily from CEA and dive shops.